The Academy Of Arts of Knowledge aims to be Fort Collins’ finest performing arts elementary school, providing your child with an educational experience that’s unlike any other elementary school in Fort Collins. Contact us today to learn more! With another school year complete, summer is finally here! While there are so many activities to partake in over the summer, it’s never a bad idea to keep learning! Here are a few ways to ensure that your child keeps learning over the summer. 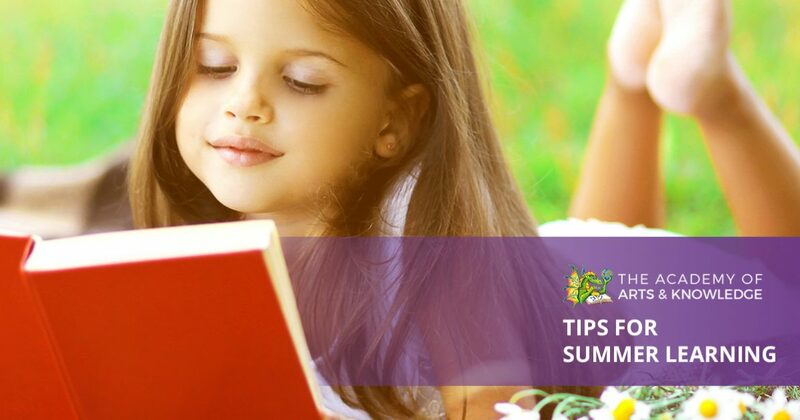 While there are so many great ways to ensure that your child keeps learning over the summer, one of the easiest ways to do so is through summer reading. While some may consider reading to be a non-typical summer activity, there’s nothing quite like enjoying a good book on the beach, in a hammock or in another outdoor setting. This is especially great for children who may not be athletic or outdoor types, allowing them to still enjoy the gorgeous summer weather in a way that is more appropriate to their individual interests. A great way to encourage that your child partakes in summer reading is to take regular trips to the library. Having them pick out books that are relevant to their interests or things that they may want to learn more about is an easy way to encourage reading, as they’ll be pursuing things that they feel compelled to learn more about. If your child reads regularly over the summer, they’ll be able to return to school in the fall with ease, not having to adjust to learning, as they will have spent a good portion of the summer doing the same. The Poudre River Public Library District organizes a summer reading program, which you can learn about here. Learning doesn’t have to be limited to the classroom, nor does it have to be limited to more traditional subjects like math, science, art and language. Another fun way to encourage learning over the summer can come in the form of cooking. Whether you plan on entertaining guests this summer, have hopes of firing up the grill or simply want to cook more meals at home, enlisting your little one to help you cook this summer is a great way to encourage learning over the summer holiday. Whether if it’s in the form of having them read the recipe to you while you do all the cooking, or you enlist their help with measuring out various ingredients, cooking with your child can not only help them acquire new skills, it also aids in the development of other skills. Measuring out ingredients, for example, uses valuable skills that can easily translate into math and science, while reading recipes keeps their comprehension skills sharp. Whether you’re in need of some help for a big dinner party or simply want to spend some time in the kitchen with your little one as you prepare a family meal on a weeknight, your child can learn a considerable amount of valuable information through cooking. Those are just a few tips for helping your child continue to learn over the summer. Whether your child is returning in the fall or you’re looking for an elementary school in Fort Collins, The Academy of Arts and Knowledge aims to be Fort Collins finest performing arts elementary school, providing our students with a unique environment for learning and development. Get in touch with us today to learn more about our Fort Collins performing arts elementary school.